The question: why study devising as a theatre artist, actor, creator or playwright will be explored in this blog post. And as always “the mask” will be discussed as the vehicle driving the learning process and leading the student/artist toward understanding a deeper creative product. The current climate in today’s performance practice, on the surface, would suggest we should solely focus our resources on learning how to audition, a particular marketable skill set, winning awards/contests or just commercial practice as concerns contemporary American realism and musical theatre. The following is not intended to suggest that there is no value in marketable skill sets, auditions skills, realism or musical theatre. 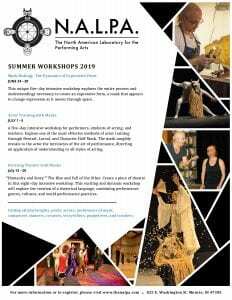 The following is intended to suggest there is something at the base of performance practice, principles at the foundation that are important to focus on if there is to be true mastery of the art form and as vibrant a future possible for theatre in the cultural American landscape. I believe we should be reaching to be theatre artists first. How we work and make a living in what we do will come in time. If we understand our art form then we can ultimately make a life in it that will out last trends. As Lecoq suggested, we should be making a theatre of all time not just of this time. Devising intends to create performance practice and theatrical languages that have yet to be seen. To succeed the artist must possess an understanding of what makes for successful art. The artist must understand what makes a work universal in its appeal. There must be an understanding of what is present in a successful sculpture, painting, musical composition, poem, story, play or dance that allows us access and creates a timeless, cross cultural allure. Why is important for the actor to study devising? What is it that makes devised work succeed or fail? What must we apply to the creative process in order to create work that will ultimately be accessible by an audience? The work fails because as Aristotle teaches us, there must be an element of imitation based on an existing truth. This imitation must be in the poetic content as well as in the dramatic structures. The work fails because there is a lack of musicality/rhythmic builds in the playing out of the event or inherent in the structures. The work fails because the space of the event is unclear or said in another way the world in which the event takes place has not been clearly identified through the action presented. The work fails because a specific desired relationship between the event and the audience has not been cultivated and or revealed. The work fails because the language/style of the performance is not in a form that either the performers or the audience can clearly follow or understand. Or said another way, the performance doesn’t teach the audience how to watch it and understand it as it is happening. To create successful work the artist creator or actor creator must possess a vast knowledge of: cultural practice, how human behaviors manifest in action, the structure of human relationships, the universal experiences inherent in the human condition, ritual and spiritual practice, the body as text, dramatic structures, story structures, poetry, musicality, understandings of conceptual structure and theatrical conventions. One is also making use of the knowledge gained through knowing how to break down story, analyze a script, analyze a character, various performance practices and the play of style. I like to refer to the book, Conference of the Birds by John Heilpern. It recounts Peter Brook’s trip though Africa in an attempt to answer the questions: What happens when we remove all understood conventions of performance in our attempt to tell a story. Can the story be told? Can it be understood? Are there universals present that we can rely on in every creative act? These questions and their answers must be part of the devising process. The neutral mask asks the question who are we as human beings in the present. What is it that we share in common universally. The larval masks ask us to understand childlike play, pure discovery and the playful sharing of that discovery with an audience. The character masks admonish the actor to understand what it is like to look out on the world with a singular perspective, understand what created that perspective and understand how that perspective colors every action and every discovery. The mask is story. Represented in the rhythmic expressive form of the mask is the story of its origin, its place of being and its past. Masks of particular cultures contain within their form the cultural practice and the understandings of the peoples that created them. Masks require a developed relationship with the audience in order to work in performance. This means the actor must have a clear and tangible relationship with the mask and at the same time be developing and clarifying the relationship between the audience and the mask as well as the audience and the story itself. The masks are like a classical instrument. One must master all aspects of the instrument, must understand it, must understand how to bring it to life and must understand all of the technique and theory behind it in order to play it successfully. The mask demands truth in its relationship to the actor, in its relationship to the story being told and in its relationship to the audience. 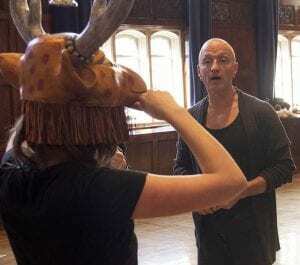 It is this demand that makes masks extraordinary tools in the devising world and if one knows how to exploit what they have to offer, success is potentially on the horizon for the work created. Take a workshop this summer, buy a mask, create on your own! Let’s make art in order to share our understandings of ourselves in an attempt to create understanding amongst people. The Larval Mask, it’s origin and use in teaching and performance. Need custom theater masks? This is the place to be!